If you ask a Chief Digital Officer what their role responsibilities are, they will tell you it has almost nothing to do with digital, and they don’t think their title represents their role. The reality is that digital transformation is a catch-all term, and digital is a pathway to the real goal: transformation. Not to sound like this is a doom-and-gloom situation, but the economics of digital are not in your favor if you haven’t fully adopted digital. As I’ve been able to spend time with CEO’s and digital leaders, a few common mistakes appear in terms of not employing a digital strategy. Nothing screams "We are afraid of the future" more than a company that says they have a digital strategy, but in reality only have a few digital initiatives that are not core to their business. The impact of digital is so vast that it can destroy a company slowly, or sometimes even out of the blue. 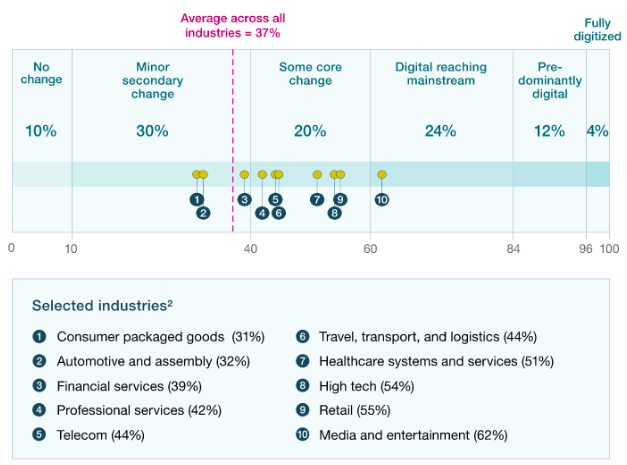 McKinsey research shows that many industries are already seeing the impact of digital taking over their industry. Tinkering in digital, AI, or machine learning is not an effective strategy. 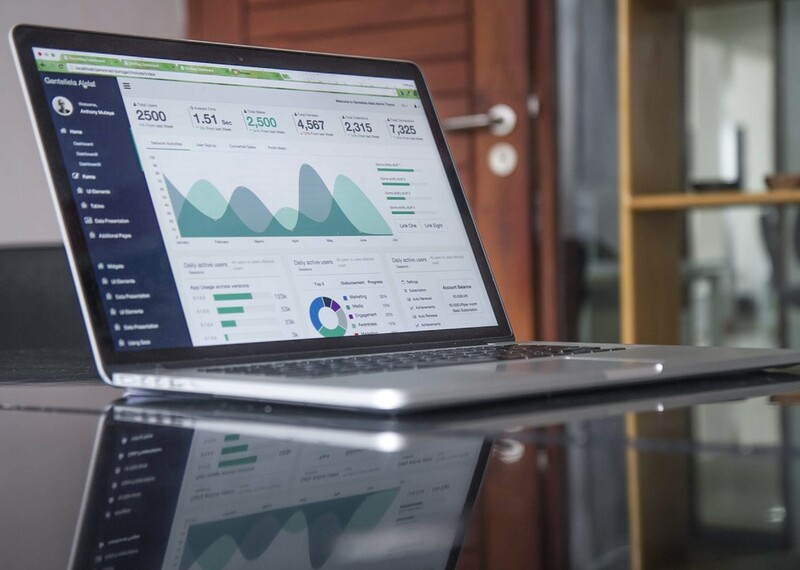 Research has proven that revenue and profit are directly related to how a company has embraced digital. Embracing digital as a company-wide initiative is the only way to truly create value. Anything short of embracing digital head-on can result in significant negative impact. To transform, companies need to embrace digital as a whole, not in parts. The entire strategy SHOULD be a digital strategy, regardless of the industry. Look at the new digital entrants in your industry and even outside your industry, and observe how they are encroaching on your business. 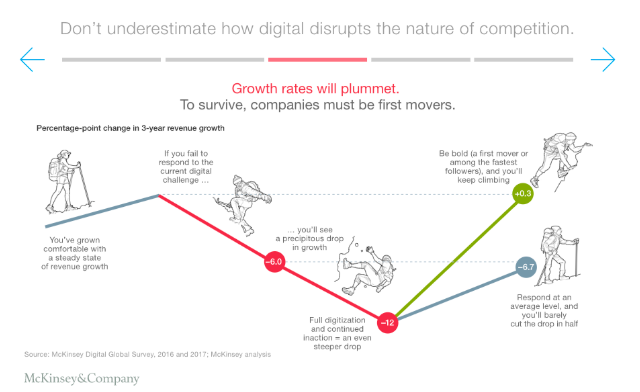 Understand the economy of digital disruption, and how fast digital is impacting companies. Move to a "shared ownership" model with leaders within the company. If the company fails to move digital forward, then the company suffers, not just the division. You know how it works. Once a year, the team gets together to talk about the upcoming year’s strategy and the budgets needed to make it happen. After it gets approved, everyone goes on their way to execute the plan. That model used to work fairly well when the impact of digital on businesses wasn’t as big as it is today. 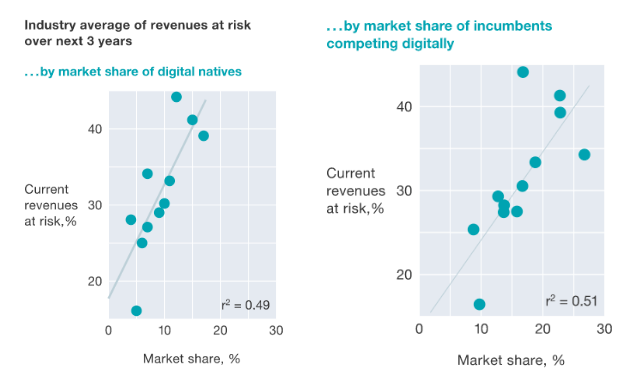 Real revenue and market share is at stake. Take a look at the chart below from a McKinsey report. This doesn’t give the team enough time to adapt to what is happening and make adjustments in real time. Recognize that partial digital strategies is not a strategy. You must own digital, and digital must be a driving force for your business, regardless of industry. Move to quarterly strategy meetings so you can update and make continuous improvements. Move to incremental plans - "grand vision" plans are impossible to meet and don’t tie into the digital strategy. If certain aspects of your plan can’t be achieved in 6 months, don’t do it. Keep a close eye on it. Pair up with a digital agency that can get you to market, and have clear results that can be measured. Farm manufacturer John Deere is a great example of a company who has recognized that their competitors are not just Caterpillar and United Tractors. They recognize that digital was impacting their core business, and they had to adapt to a different strategy than just making better equipment. Their equipment is now being commoditized because of other digital entrants who are making farmers more productive by using the same equipment, but with new sensors, artificial intelligence, and data analytics. John Deere recognized this and has now entered the space in a big way. So, should they focus on making better equipment, or focus on how digital can improve the productivity of their equipment? A real digital strategy will address this. Evaluate who your real competitors are. Don’t assume companies in your industry are your real competitors, because chances are they are facing the same struggle. Map out what parts of your business can be impacted by digital. In John Deere’s case, the solution is to not just build better equipment, it’s to create a new service value add business for their customers that utilizes the new functionality, such as preventative maintenance. Companies tend to hire a head of innovation as a way to tell the market and the company that they are investing in innovation, but it’s usually just that, a way to tell the market. In the end, innovation and digital transformation is the role of the CEO. In most cases, innovation centers look great and are PR-worthy, but rarely make it back into the core business. Digital is a path to real transformation and needs to be adopted by every part of the organization. Move resources to high-reward projects instead of spreading thinly across multiple projects. Be flexible in resources across the yearly plan. Invest in enabling innovation on all teams, not just an outside group of innovators. Create real goals that can be obtained in 6 months. Ramp up hiring of digital talent and digital executives to help you accelerate your needs. Partner with a digital agency to become a first-mover if you don’t have the resources, or if you need to stand up a digital business quickly. Digital is not an afterthought, and it isn’t a marketing technique. Digital is driven from the top and affects every part of the business. Businesses that have embraced digital have proven to be more successful.